0.05% of Twitter users generate half the tweets on Twitter – that’s what Yahoo found in a new study. Half the tweets were created by what Yahoo called ‘elite’ users, meaning the media, celebrities, organisations and bloggers. The study also confirmed that people tend to flock to others who are like them on twitter: celebrities listen to celebrities, while bloggers listen to bloggers, and so on. This makes Twitter more an information-sharing tool than a social network, the study concluded – not a controversial stance really, but this study is interesting because it has studied more thoroughly who listens to what on the site. 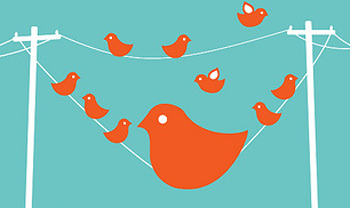 “The Twitter follower graph … does not conform to the usual characteristics of social networks, which exhibit much higher reciprocity and far less skewed degree distributions, but instead resembles more the mixture of one-way mass communications and reciprocated interpersonal communications,” Yahoo said in the study, entitled ‘Who says what to who on Twitter’. So if we only listen to the people we find interesting, and only a small percentage of Twitter users have loads of followers, does that mean that most people are … boring? Hm. Proposal via iPad 2 – it&apos;s happened.